Last week I went along to the rather lovely new Jo Hansford salon in Mayfair to find out more about their special package they have on offer in celebration of the Jubilee – the ‘Great British Blow Dry’. Having tended to ‘many a royal mane’ the stylists at the salon really know how to deliver (and teach – as I found out) a selection of key royalty-worthy looks. The ‘Royal Rebel Roll’ – a classic bun, that could be styled sleek or messy, depending on your personal style. The ‘Royal High-nest’ – a stylish up-do, inspired by a cross between a classic Bardot style and the style Princess Eugenie wore on the cover of Tatler. Again, can be smooth or messy, depending on your own style. The ‘Duchess’ – the very much in-demand look a-la Kate Middleton…all volume and glossy waves. I went for the ‘Royal Rebel Roll’…with a slightly messy finish as I’m not really very good and being perfect and polished when it comes to my hair – even if it starts out nice, it will end up a bit messy…so might as well make it part of the look! The Royal Rebel Roll was amazingly easy to create – using a hair donut (as pictured above). An absolute must-have if you have thin/fine hair and want a decent sized bun (if I do one of these without the donut I end up with a stump on my head rather than a nice looking bun). The key was using pins after creating the bun to pull it closer to the head, so it looked more styled rather than ‘stuck on’. There was a competition on the night to win this rather gorgeous (and suitably regal) tiara…. I didn’t win! 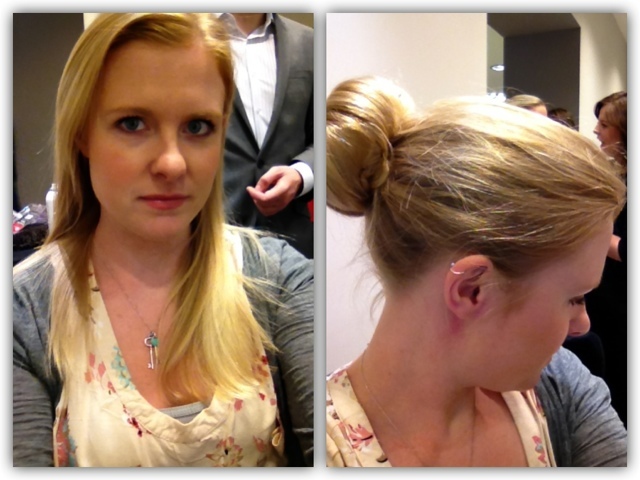 The prize went to Llymlrs who created a gorgeous up-do, but with her own twist on it. Below are a few more snaps from the evening so you can see the finished result…. It’s worth a mention that the package at the salon if you want to get the Royal treatment is a little different to how I experienced it on the night. At the salon you can book in for the ‘Great British Blow-dry’ package, including: a blow-dry (choosing one of the royal-inspired looks) where you will be taken care of by one of the fab stylists plus you will recieve a manicure…all the while enjoying refreshments of Pimms, scones, London-themed biscuits and of course, English tea. To give it the overall British feel. I was a guest at the above event.